He then worked at National Semi 2 months before there was a huge layoff. Other companies followed with similar fates, due to the timing of the job market. He has been at Analog Devices for 25 years now! Awesome! He started in field applications but now works in central applications, developing writings and seminars. The most famous of which is the Linear Circuit Design Handbook, one of the best (free!) resources available online for analog. Hank was the editor and there were other contributors as well. They called the book, “the seminar that never was”. Hank works out of the San Jose office and his home office, but also travels around to train people. He’ll let us know when he’s doing his next public seminar. Both that article and an article by Henry Ott about split ground planes (Henry was a former guest of the show) helped Chris get through many design problems. Hank suggests to “Think like an electron”. While working on a particularly difficult verification circuit, Hank had to build a 3500W linear amplifier(!!). Hank puts the “Low vs High Frequency” division at about 10MHz-100MHz. Basically when you need to start worrying about EMI. Integration continues to increase in analog components. Chris recalls the ADuCM350 discussed last week. In order to keep advancing technology, we need more package changes. Really this means we need to be able to access I/O on silicon. Hank maintains his audio hobby, including his work as a musician. He built an outboard DAC with a “ludacris fringe” — a 7 pole filter for the DAC output. Wowza! Many people don’t understand the mechanical to electrical conversion process, as in an accelerometer. Hank says they measure zeptofarads. When looking at ADCs, some look at SNR and some look at ENOB. Hank doesn’t work much with IBIS because he stays in the relatively low frequency realm. The newere tech is “evolutionary vs revolutionary”. But that means consumers will get more for less (and faster!). Chris likes the isolators like the ADUM2401. PLLs are getting faster too…now running around 18 GHz! Hank’s next series of articles will be about phase response filters. This will appaear in the Analog Dialogue, an awesome newsletter about all things analog (a little bit of marketing, but its bearable). There are also very valuable archives. Thanks so much to Hank for talking to us on the show this week. It’s always great to get analog gurus with their war stories on the show! Also, thanks to Michael Ossmann (@michaelossmann) for joining us again! Chris. When will your trip to LA be? I work from time to time at Carolla digital on Adam Carollas show in Burbank maintaining the studio and actually need to make a trip down anyways. Wanted to talk to you about the forthcoming podcast lawsuits we are fighting. I’ll be there from later on Monday night until Thursday late morning. Would love to talk shop and possibly see the studio! I’ll be out in Pasedena but don’t know my schedule yet. I’ll shoot you an email. 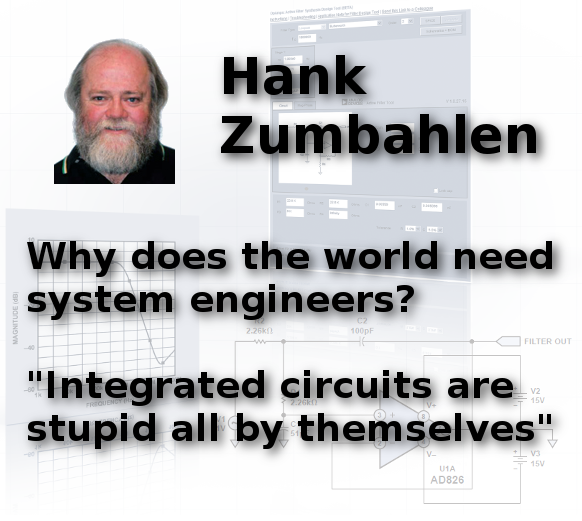 Hank’s got the best wife a system level electrical engineer can have. Brings a tear to my eye just thinking about it. Great references, thanks for providing them at no charge. I think I will keep them in PDF form since printing them would make my printer quite angry!! Just checking to see if you got my emails. Another solid show, you guys have been getting awesome some awesome guests!